Our Bender Preschool carries messages to the community all around us. Children, parents and our environment communicate our values, goals, emotional connections and our vision for the future. We build relationships with those around us, and with ourselves by the way we connect these beliefs about children and childhood, and we are forever changed. 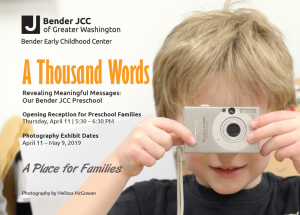 We invite you to enter our sacred world of messages through the lens of our most influential change-makers: our children and their teachers. For more information, contact Ora Cohen Rosenfeld or call 301-348-3830.